Old Lake Shore Cooperative, Inc.
A great community with caring and giving neighbors. 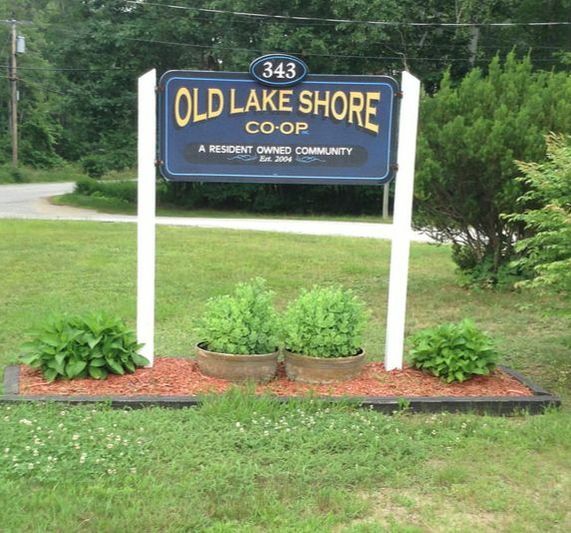 Unlike other manufactured home parks (or mobile home parks), Old Lakeshore Cooperative is owned by a non-profit corporation that was created and is controlled by the residents of the cooperative. The Town of Gilford is located in central New Hampshire, on the southern shore of Lake Winnipesaukee and the northern slopes of the Belknap Mountain range. Gilford was first settled in approximately 1777, when it was still considered the “Gunstock parish” or “upper parish” section of the Town of Gilmanton. In 1812, the Town of Gilford was incorporated into a separate town. The privilege of naming the town was afforded to Captain Samuel B. Mason, the oldest and most famous citizen. A veteran of the Revolutionary War and the War of 1812, Captain Gilman named the town “Guilford” after the Battle of Guilford Courthouse, a decisive Revolutionary War battle in North Carolina in which he fought. The town was spelled incorrectly in the incorporation documents, resulting in the present spelling of Gilford. Gilford remains the only community in New Hampshire named after a Revolutionary War battle. The advent of the Lake Shore Railroad marked the beginning of summer tourists to Gilford. Many local farms accommodated summer boarders to supplement their income and, in 1843, a group of enterprising farmers from the Intervale even produced a tourist brochure! By 1895, island properties were being actively marketed for seasonal use. By the turn of the century, winter sports enthusiasts were also frequenting Gilford. Cross-country skiing and jumping were the first ski activities enjoyed by both residents and visitors alike. Alpine skiing became popular in the 1930’s, and Gilford was the destination of the first famed “snow train” transporting skiers from Boston to what is now the Gunstock Recreational Area. Some of the first ski trails and the state’s first motorized ski lift, a gasoline powered rope tow erected in 1934, were situated on the western slope of Gunstock Mountain, just off Belknap Mountain Road. The natural splendor of the mountains and lakes continues to attract visitors and seasonal residents to Gilford. Appropriately, you may note that the Gilford Town Seal features a depiction of a sailboat on Lake Winnipesaukee with Belknap and Gunstock Mountains in the background. As its motto states, Gilford truly is the “Recreation Center of New Hampshire”.